1) Preheat the oven to 350F/175C for 15 minutes. Grease the muffins tray with oil or line it with muffin cases. Keep it aside. 2) In a medium size bowl, beat sugar and egg until it is light and creamy. 3) In a large size bowl, mix all purpose flour, baking powder, salt and nutmeg. Mix well. 4) Add the beaten egg, sugar mixture to the flour mixture. Mix well till it has blended well. 5) Add in vegetable oil, milk and vanilla extract. Mix well. 6) At the end, you will get a creamy, smooth batter. 7) Pour this batter equally to prepared muffin tray, say about 3/4th full. 8) Bake it for 15-20 minutes or until the tester/toothpin inserted into it comes out clean. 9) When the muffins are in oven, prepare for rolling. 10) Melt the butter in one bowl. Mix sugar and cinnaman/nutmeg in another bowl. 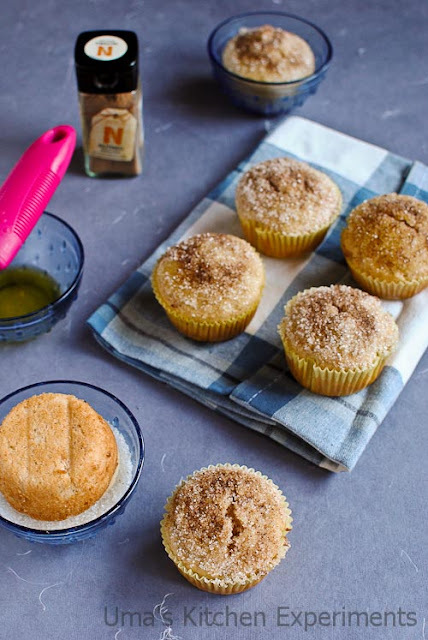 11) When muffins are ready and warm, dip the top of the muffins into the melted butter and roll it in the sugar cinnamon mixture. 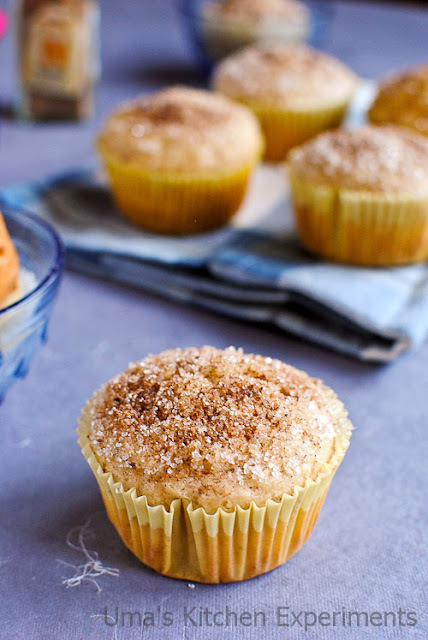 Love these yummy muffins.. Beautiful clicks..
Lovely, sugary & cinnamony!!! Just wanna grab them!! Very perfect and yummy muffins. Love the toppings. 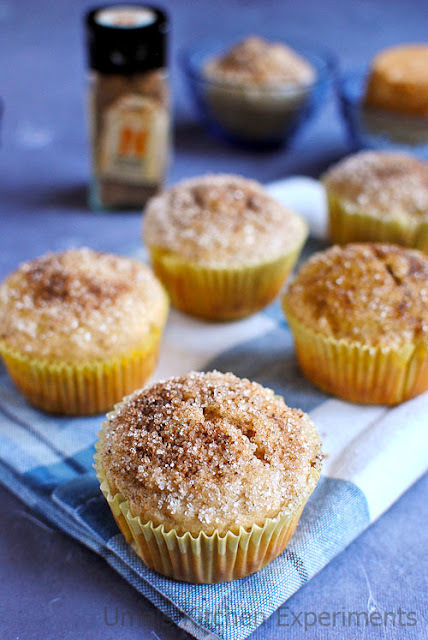 I feel like munching these donut influenced muffins..It was in ever to-do list..i can go nuts for donuts anytime. Wow..they look so cutee,yummy muffins !! 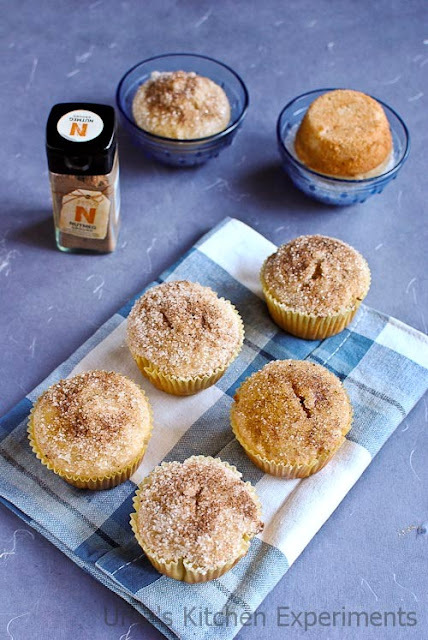 I love the flavour of cinnamon wafting through my kitchen, these look very sinful! liked all your clicks, neatly presented! Incredible muffins, i want some seriously now, craving for donuts too. The topping is very simple but tasty. Looks delicious. Loved these! The whole family loved them, especially our little one. Great recipe! Yum, these look so delicious! Give me one of these for breakfast and I'll be a happy girl. The top sugary part looks like heaven.